The Daniel Fast requires some unique balancing moves. It’s not like a “normal fast” when you drink only water and that’s it. And it’s not like a “juice fast” when your choices are clearly defined. On the Daniel Fast, which is a “partial fast,” some foods are eaten and others are allowed. And the choices are wide and many. So you will need to spend some time thinking about food and food choice for meals. But you don’t want food to become your focus . . . and you don’t want the Daniel Fast to become another way to satisfy the desires of the flesh by concocting “yummy, delicious, scrumptious” meals. Does that mean your meals shouldn’t taste good? No. But it does mean that you want to keep the first thing the first thing. Jesus says, “Seek first the kingdom of God and His righteousness.” We want to keep Jesus and our growing relationship with Him as the foundation of the fast . . . and not the food! So how can you still eat according to the Daniel Fast Guidelines and not get carried away? Here are a few simple steps you can take so you are sure to keep Jesus first. Decide to eat more simply for this period of prayer and fasting. Prayerfully consider the purpose of fasting and how it can be a powerful time for putting the flesh under the authority of the Spirit. Don’t make the Daniel Fast more complicated than it needs to be or should be! Humble meals. Simple dishes. Flavorful and pleasing is fine . . . but in balance for the purpose of fasting, which is to restrict food for a spiritual purpose. Plan a few simple meals. I like to tell the people I coach about the fast to plan just 3 breakfast menus, 4-5 lunch menus (using leftovers from dinners is great), 5-6 dinner menus and then about 3 different snacks. Then you can rotate these menus and get good at preparing them and making sure you have the ingredients on hand. Keep your meals uncomplicated and undemanding. Then you won’t have to be so consumed about meal preparation and about satisfying the flesh! Instead you can focus on God, study and prayer. Prepare several meals at one time. For example, make a double recipe of Vegetarian Chili and freeze one and eat the other for dinner and lunches. Using this pot of flavorful and nutritious chili as the center of your menu makes it easy to add a simple green salad and flatbread for a nutritious and satisfying meal. I like using Saturday as my meal prep day. I plan and prepare five or six meals and I use the time to pray, listen to worship music, memorize scripture or listen to a teachings. The time flies by and meanwhile my spirit is fed and I experience the joy of the Lord during my labors. Using these simple approaches will do two things. First, when you plan and prepare ahead you will be ready and have the primary parts of your meals on hand! You won’t have to worry about, “What’s for dinner?” You’ll know and it will be simple and easy for you to finish up the meal and stay on the fast. Second, you won’t be anxious! I hear from many people who end up quitting the fast because of one of two reasons: 1) they felt preparing all the meals each day took too much time and energy; 2) the meals were too complicated and too expensive. 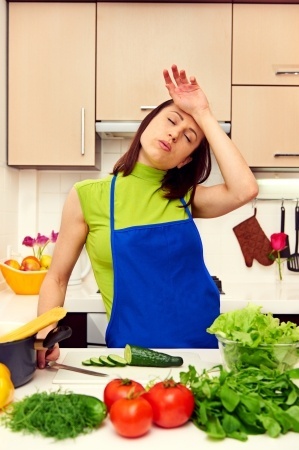 You can avoid both these issues by keeping your meals simple and preparing them ahead of time. But the most important benefit about all of this is that you won’t be centered on the food. I’ve had people write to me and say, “Susan, I spent too much time trying to make all these special meals and new recipes each day. I realized I was really on nothing more than a diet . . . and I totally missed the blessing of the fast.” The good news is that you can make sure you don’t miss out. Keep your meals simple. Plan only a few menus that you like and can rotate them over and over again. And prepare ahead so you have the food on hand and available so you don’t have to think about food too much . . . and so it won’t take up too much of your time! Be blessed as you grow in the knowledge and love of Jesus during your fast. I encourage you to pick up the book, Emily. 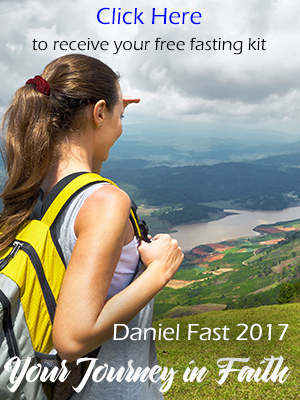 The Daniel Fast book (Kindle edition) is on sale right now on Amazon for just $2.99. It has all you need for a successful fast. Yes, if it’s brown basmati rice. Only whole grains on the Daniel Fast. Was wondering if basmati rice allowed on the Daniel Fast? Thank you so much for tanswering my questions. I am looking forward to this spiritual journey. Be Blessed! The Daniel Fast is totally plant based, so beans (or vegetables) cooked with meat is out due to the animal protein that would then be cooked into the beans (or vegetables). Instead, try cooking the meal separately to be added into your families portion after yours is removed. Type of Waters – spring water, distilled water or other pure waters (this would also include pure well water), and yes, even tap water is fine if that is all you have available. I hope this helps! This is my third time asking these questions. Please answer before I start my fast this Friday. Can I drink tap water instead of distilled? If I fix a meal like red beans and sausage for my family, can I eat just the beans from that meal? I am on day 11 and I feel wonderful, I am drawing closer to God and my head is clear and focused. The first 2 days were tough, because I am an avid coffee drinker. Now I feel refreshed and can do all things through Christ, who has been strengthening me. Thanks Susan. I already 7 days now Daniel with my husband and my daughter. Your recipe online is very helpful to me.